Geoffrey of Monmouth in ‘The History of the Kings of Britain’ mentions two temples in connection with pre-Roman London — the Temple of Concord and the Temple of Apollo. The Temple of Apollo is thought to have been where Westminster Abbey is now and there is no doubt that the Abbey was built on an already sacred site, the present abbey was built on the site of an earlier Late Anglo-Saxon church (Edward the Confessor). 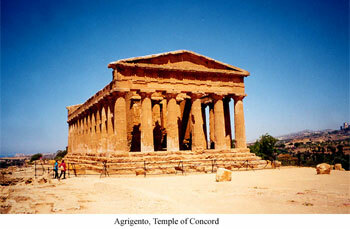 This in turn replaced an earlier church which legend says was consecrated by Saint Peter the apostle. 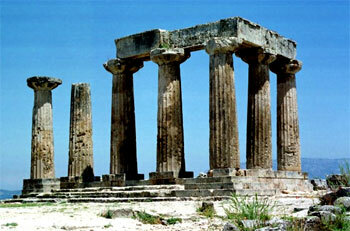 This is what William Camden had to say about the Temple of Apollo in his ‘Brittania’. By this surburbes Westminster, which some time was more than a mile distant, is conjoined so close unto the City of London that it seemeth a member thereof, whereas it is a City of it selfe, having their peculiar magistrates and priviledges. It was called in times past Thorney of Thornes, but now Westminster of the West situation and the Monastery. Most renowned it is for that Church, the Hall of Justice, and the Kings palace. This Church is famous especially by reason of the Inauguration and Sepulture of the kings of England. Sulcard writeth that there stood sometimes a Temple of Apollo in that place, and that in the daies of Antoninus Pius Emperor of Rome it fell downe with an earth-quake. Considering the importance of religion it may seem odd, but fashion, in its broadest sense, seems to have had an influence on which temples were built, and when, and who they were dedicated to. Most historians regard Geoffrey of Monmouth’s history as totally made up. If this is the case then he was exceptionally lucky with his choice of temples as they fit very neatly time-wise with other known examples. If they did exist, it is difficult to see how they could be radically different from the known examples as they would have to be recognisable to their respective worshipers and therefore they would have been unmistakably classical, virtually indistinguishable from Roman buildings. It is unlikely that a wooden building could be destroyed by an earth-quake for instance. The legend of King Bladud attests to the Temple of Apollo being a substantial building, certainly not thatch and mud, as when he was experimenting with man-powered-flight he crashed on it, dashing himself to pieces, a not unlikely outcome given what we know about the early flight pioneers of the 19th and 20th centuries. 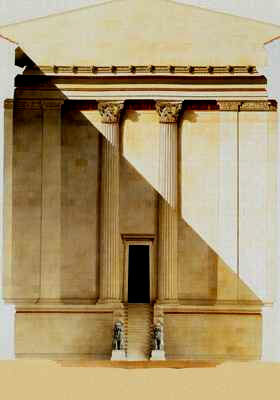 Remarkably the likely position of another temple in early London, the Temple of Concord, has been recorded, this too seems to have been a popular type of temple at this time. This Mulmucius Dunvallo is named in the English chronicle Donebant, and proved a right worthy prince. He built within the city of London then called Troinovant, a temple, and named it the temple of peace: the which (as some hold opinion, I know not upon what ground) was the same which now is called Blackwell hall, where the market for buying and selling of cloths is kept. 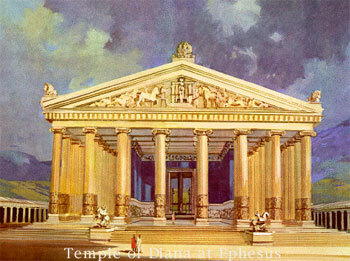 There was a third temple in London, the Temple of Diana. 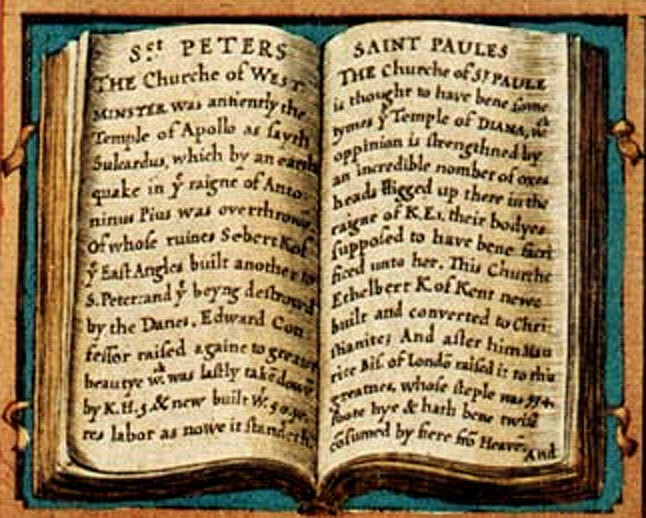 This was presumably the building discovered by Wren while digging the foundations for his St Paul’s Cathedral but he thought that it was Roman, but it was probably much earlier. That there stood in old time a Temple of Diana in this place some have conjectured, and arguments there are to make this their conjecture good. Certaine old houses adjoining are in the ancient records of the Church called Dianaes Chamber, and in the church-yard, while Edward the First reigned, an incredible number of Ox-heads were digged up, as wee finde in our Annals, which the common sort at that time made a wondring at, as the Sacrifices of Gentiles, and the learned know that Taurapolia were celebrated in the honour of Diana. I my selfe also when I was a boy have seene a stagges head sticking upon a speare-top (a ceremony suiting well with the Sacrifices of Diana) carried roundabout within the verie Church in solemne pompe and procession, and with a great noise of Horne-blowes. And that Stagge or Hart which they of the house de Bawde in Essex did present for certaine lands that there held, as i have heard say, the Priests of this Church, arraied in their sacred vestiments and wearing garlands of floures upon their heads, were wont to receive at the steps of the quire. Now whether this were in use before those Bawds were bound to exhibite such a stagge, I wote not, but surely this rite and ceremony may seeme to smell of Dianas worship and the gentiles errours more than of Christian religion. And verily no man neede to doubt that from them certaine strang and foraine and heathenish rites crept into Christian religion. Which ceremonies the first Christians (as mankind is naturally a pliant sectary to superstition) either admitted, or else at the first tolerated, thereby to traine and allure the Heathen from Paganisme by little and little to the true service and worship of God. As Prince Brutus was supposed to have had a vision of the goddess Diana during a prophetic dream at a temple of Diana he had found on an uninhabited island in the Mediterranean. In the dream, she told him to settle in Britain, so this is precisely the type of temple that you might expect him to have built although there does not seem to be any direct link between the temple and Prince Brutus in the histories. 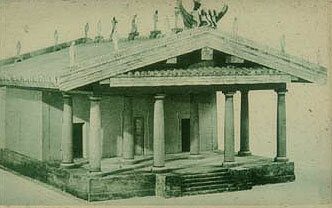 However if Brutus had built the temple it would most likely have been a much more humble affair. 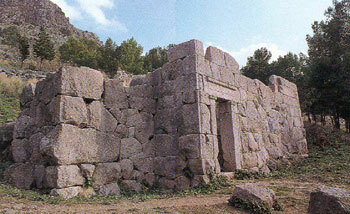 This image is of an earlier type, an eighth or ninth century BC, temple of Diana in Sicily, one built by Brutus would have to date to around 1100BC.